While searching an old external drive, where I keep for safety alot of things, I came across some very old notes from my trips to Ukraine and I thought you may enjoy reading them. Bear in mind that these are dated notes of mine and raw material, "posted as is", and no editing is been made but I hope you will enjoy going through! Some of the pictures are not of good quality but still can give you an idea of the place, during that time. The original idea for writing notes and these letters, was my son’s Alexis, who always encouraged me to write and keep notes, wherever I go, because he enjoys hearing of my travelling experiences. Many thanks must go to my Ukrainian friend Clyna, a lady living in the UK and kept in constant touch with me, following my days, asking many questions, making suggestions and commenting accordingly. Of course we don’t agree in everything and have many differences but we both have something in common. 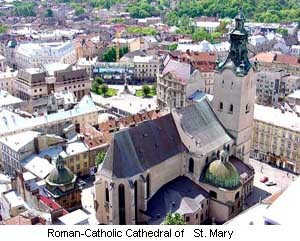 We love Ukraine and especially Lviv town. Also I must say thank you to my interpreter, Iryna in Lviv, who kept me company all the time I was there and guided me through the area and various places we visited. I must not forget to say thank you the nice young girls, Yulia and Ira in Lviv, who helped me to save, organise, e-mail and keep track of everything. My travel love affair with Ukraine started sometime in the second part of year 2003, when a woman, called Galina, who lives in Lviv (the Capital of Western Ukraine) got in touch with me by e-mail. She was obviously looking to make friends in the West and discovered my profile on MSN. Galina is a programmer and works as IT support for the Power Distributing Company, which provides electricity in the whole Western part of Ukraine. Galina is Russian by decent and married to a University professor at Lviv University and she speaks very good English. We continued our contacts over the months and finally we met at St. Petersburg on the 13 February 2004, where she had gone to meet a friend of hers (Ludmila) and to have a two weeks holiday. I have travelled, nearly, in every European country and always wanted to visit Russia but it never happened before. This time I found a very cheap ticket with Lufthansa so I got a same day Visa from the Russian Consulate in London and on Friday the 13th February I flew there for a 5-day trip. Galina and I did get on very well and she was an excellent translator and a guide to the city. We visited most of the interesting places and palaces and with her assistance I discovered the real life behind the ex-iron curtain. You can watch a photo album presentation from my visit to St. Petersburg by clicking here. After my return to England we continued e-mailing to each other and talking on MSN messenger. 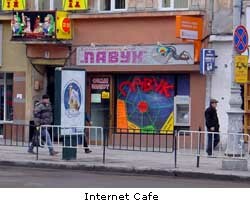 Galina told me a lot of things about her city, Lviv, which made me, interested so I made a few searches on the Internet. Finally I decided to visit Lviv on the 8 May 2004, which I did, but in the mean time Galina and I had an argument, because she promised to find me a cheap apartment to stay when I was there but 7 days before my arrival she had done nothing about it. After this episode we did not speak again, neither met when I was in Lviv and I lost contact with her. Having booked my flight I was now faced with the dilemma of cancelling my trip or having to look around and make my own accommodation arrangements. I placed a post on BRAMA (Ukrainian information board on the internet) in the travel section and Clyna (Carolyn) who lives in Harrogate, in the North of UK, but is of Ukrainian decent and has family in and around Lviv, answered with a lot of good suggestions. She introduced me to her friend Irene who accepted to act as my guide and interpreter, whilst visiting Lviv. At the same time, Clyna gave me details of the local travel agency she uses every time she visits Lviv and I booked a very nice apartment through them for $20 per night. During my first visit to Lviv Irene guided me around and I fell in love with the place. On my return to England I decided to start a small tour operation there but I have encountered expensive airfares, so very little is been done during the year 2004. 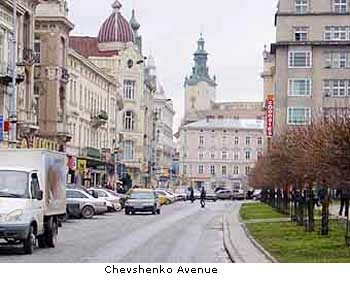 I have created a web site (http://www.ukraine.ukgo.com) and there you can read all the necessary information about Lviv. 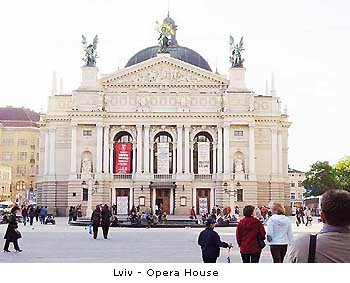 Also, by reading the pages in my web site you will find out why I fell in love with Lviv. At the World Travel Market, which took place in London at the beginning of November 2004, I met representatives from Ukrainian International Airlines, who offered me their special fares to Kiev. For this reason I decided to go back to Ukraine and organise some hotels in Kiev to facilitate the new fares and provide an alternative solution for my packages to Lviv. During my second trip there I had a fascinating time and I was fortunate to experience, with my own eyes, history in the making, I arrived at the highest point of the Orange revolution and felt the excitement and zest for democracy of the Ukrainian people. 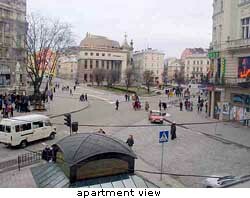 I went back to Lviv on the 5th January 2005 to see their Christmas on the 7th January. I had been told that they have big celebrations and I had a great time. I have made a few friends and more acquaintances. 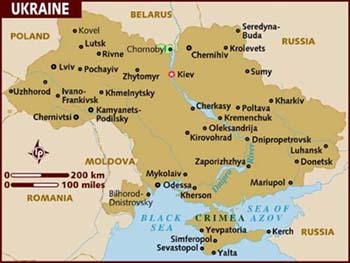 On the 31 March 2005, the new Ukrainian Government announced that they temporary suspend the requirement of having a Visa to visit the country, so I decided to take advantage of the new situation and visit Ukraine, especially the regions of Crimea and Odessa with the view of expanding my small holiday program to these regions. On the 1st of May 2005, the day the No visa requirement came into effect, I flew out to Ukraine for a 14 days visit. My flight on Ukrainian International Airlines from Gatwick to Kiev was excellent in every aspect and the onward flight to Simferopol in Crimea was not bad at all. I visited Sevastopol, Yalta then went by train to Odessa and of course I could not resist the temptation and flew back to Lviv via Kiev. 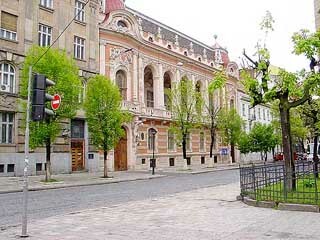 I love Lviv because it reminds me of my hometown, Ioannina in Greece, when I was young. It is not over-commercialised like a lot of western cities and has a calming and relaxing atmosphere, which I adore. It is full of excellent architecture, despite its rundown condition at the moment, but hopefully one day the Ukrainians will manage to renovate and preserve this open living museum with such a wealth of history, art and architecture. I can spend several days there doing very little, yet still not get bored. I am sure that I will be making more trips, in the future, to Ukraine and Lviv. I find Ukraine very interesting and Lviv very enchanting. Flew to Lviv via Warsaw on an early morning flight on LOT (Polish airlines). Comfortable flights on both legs, especially on Warsaw to Lviv where they substituted the prop ATR72 with a Jet Embraer, which has excellent, leg room and comfort. Disappointed with the service as staff doesn’t speak English and if, as some do is hard to get their attention. Also the food was terrible in all my flights. They have to improve their standards a lot especially with the expensive prices they charge, now that they have joined the EU. A light rain welcome us at Lviv airport, and a schene from the film " Apokalypsis ". All around the small airfield very old planes (probably from the Soviet Era) are scatered in a state of decay. As I noticed on my departure it serves also as a military base too. The terminal, from airside, is a small grim and foreboding building, with few small windows and about 50 metres tiled passage lies between the terminal and the place were the passengers disembarked the old buss. 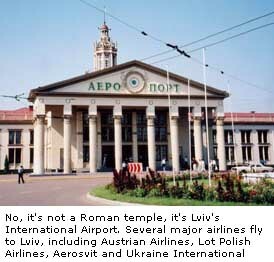 The front of the terminal is of course grandeur styled building, as most of the buildings in Lviv. A middle aged but smartly dressed lady, Ala, advise me to stay on the bus. When all pax disembarked they drove to the end of the building where I followed her through a small new door and enter a nice small waiting room. 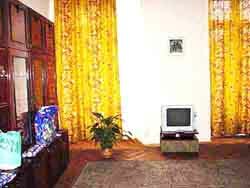 The room is equipped with comfortable sofas, tables, bottled water and glasses plus a TV on the corner. Finally I manage to do it and give the card to Ala. After a funny and hilarious time of around 30 minutes, Ala, managed to locate my case. Clearing customs was a simple formality with no problems and we are on our way to the center of the town. 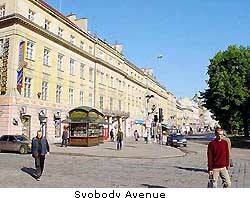 It is only a short 10 ninutes drive to the apartment that I have booked to stay, at SVODOBY Prospect (Avenue). Now I am glad to have booked the VIP service which is expensive ($32) but takes all the immigration hasle away. Nice 1 bedroom flat with very high ceilings, double bed, large sofa, TV, large kitchen with a table and chairs next to a large window. Bathroom very large and hotwater 24 hours. I am happy. Visit the office pay the bill and Irene and I go out for a drink and dinner. 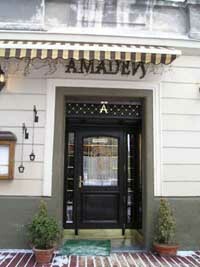 Visiting Amadeus Restaurant, have to wait for a table to be free. We walk down and get the first feeling of Prospect Svobody, where at the weekends newly weds come to take the official pictures. What it strikes me, and my guide Irene makes joking remarks, is that the couples do not look happy and joyful. Walking to the end of the Svobody Prospect, where is the Opera House, we mingle with the locals who come here to have a stroll, watch some men playing chess on the benges circled by a small crowd watching attentively the games. In either side of the pedestrian there are trees full of flowers and very well kept, which makes the scenic idyllic. Traffic is not allowed to run around the square during the weekends, which makes it more pleasurable to walk up and down the square. After about one hour we decided to go back to “Amadeus restaurant” where finally we are given a table in the corner. It seems quieter now. Amadeus restaurant is a great place for a romantic dinner! Prices are on the expensive side, in comparison with all the other reastaurants of the same standard and quality, as I found out later. 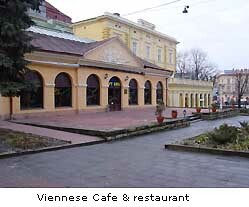 After that we go for a coffee to another place called Viennesse Café and continue chating till late. Arranged to meet Irene next morning and off to sleep at around 11 pm. After having a coffee in the flat is time to go out for Breakfast, as I am starving. 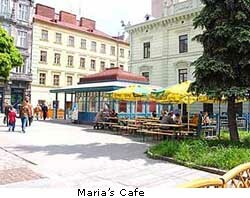 As I walk up and down the Svobody Prospect (avenue) I discover this little small cafe, I would call it “Maria’s Cafe”, off the main square and in a small one called, Pidkova Square. It is right opposite the Church of the Jesuits and the club “Yellow Submarine! On my later trips I noticed that the club has closed down. Trying to order a coffee (Nescafe) and I become lucky, as later I discovered this cafe is the only one where I can have my favorite drink. Price is 1 Chryvnia (11 p). After enjoying my coffee try to ask Maria, the woman behind the bar, if she is cooking hot breakfast but I am getting nowhere until a chap speaking some English tell me that they don’t offer it there. Disappointed I go next door to a very good looking Cafe/ restaurant called “Viennese” where I have breakfast, but prices obviously are more expensive here. I paid 10 UHA for 2 eggs and ham, toast and a coffee. Irene arrives and after finishing her tea we go shopping to a supermarket and then back to the flat because it started raining. Later when the rain stopped we go walking from Copernicus Street towards the Library, see the Main Post office and then after passing a University building we go to the Science House. We bribe the keeper on the door with 10 Chryvnia ( £ 1.10 for both) and he let us walk through this magnificent building. 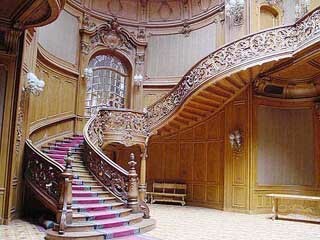 The staircase, which follows a round wall, is a magnificent peace of sculpture. 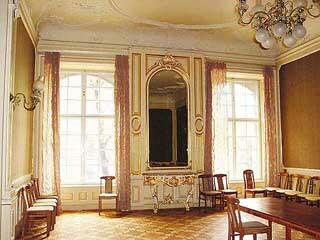 The rooms are very elegantly decorated and pity that this monument is not open to the public but just for private functions. Having a coffee in the Caprice Cafe later I meet a woman called Inna, who speaks Greek. Having spent 2 years in the Greek island of Zante she is delighted meeting me and very helpful. Walk our way back to Svobody Avenue and by then I had enough walking for my first day so I suggest to get on a Tram and go from one side of Lviv to the other. These old trams from the Soviet Era look like they are more than 50 years old but they are still going and what is surprising is that they are driven by women only. Irene explains to me that women here are cheap labour. Well it seems to do the job and it goes eastwards up hill, passing through the Market Square where is the town hall, and then the Church of Assumption and the Town Arsenal. As we travel to the outer parts of town it is obvious that the architecture is changing and more plain building can been seen either side of the road. At the end of the Cobble Street the tram is turning around and the main road continues with asphalt. There is nice green park at the last stop and back towards the town center. After that we go to the other side (west) and the same thing happens, less decorative houses and all of them in a state of disrepair. Arriving back to the main Svobody Avenue there is an open concert for young signers.....and we have fun listening the youngsters giving their best performance. While watching the youngsters we meet the mother of the murdered reporter Georgiy Gongadze, a crusading young journalist whose headless body was found lying in a ditch on the outskirts of Ukraine’s capital, Kyiv. She is a very attractive and dignified lady. She allows me to photograph her. Back to the flat to have a rest. I started getting a bit tired with Irene because she is very secretive, never reply a straight question and makes no suggestions. Sometimes I have the feeling that she is not listening and I have to ask twice the same question but later understand that is characteristic of the western Ukrainians. The Russian occupation has a lot to answer for that attitude. Her spoken English and heavy accent is not good for my ears but I expect I will get used to it soon. I get the feeling that she is not an extrovert like me, despite that she is an Aquarius. There is a certain lack of oomph on her character that is starting to affect my enthusiasm about the town but, I think to myself, I will not let it affect me. Going for dinner to well recommended restaurant (Cupol), in the local tourist guide, we eat a very poor quality fish and seems we are the only clients in the restaurant. Even Irene asks me to leave early and she goes home and myself go to the Internet café, next door to my flat to have a chat with the UK. Too late to do anything else so back to my apartment. Today I wake up early and after enjoying a coffee or two in the apartment, spent a bit of time writing some notes about my trip. Then looking outside of my window, I see a lovely sunshine day, so I decided to go for a stroll and to look for some postcards, usual activity on a tourist visit to a new place, keeping the folk back home and family happy. I went walking towards the south end of the Svobody boulevard, the opposite direction from the Opera house, taking photos on the way and admiring the various buildings and then inspecting from outside and also taking a quick look inside the grandiose looking Hotel George. 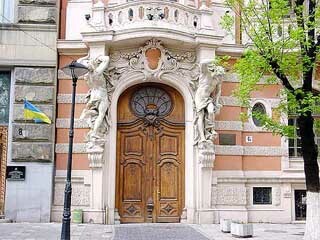 The hotel George is the most famous hotel in Lviv. It was built around 1899 in the eclectic style of Neo-Renaissance by the Viennese architects Ferdinand Fellner and Hermann Helmer. Partially renovated in 1996, is one of the oldest hotels with a privileged location, right in centre of the city. The combination of discrete elegance, modern conveniences and perfect location make the George hotel an ideal place of relaxation for businessmen and tourists. George Hotel it's a short walking distance from the Opera House and Town Hall square (called Market place) with its numerous historical buildings and architectural monuments. I start liking this small café which as it happens, was the first port of call early in the morning for the rest of my stay in Lviv. All women there don’t speak a word of English but they are very helpful and charming with their efforts and to top it always played soft Italian music. At around midday Irene, my guide, arrives and finds me at the Café writing more notes. 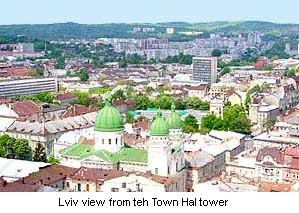 She suggests we go and visit the tall tower at the Town Hall in Rynok Square where we can have some superb views of Lviv. Usual story, paying somebody a dollar to let us in, take the lift to the first floor and then start climbing the long steps to the right top. It took me sometime and had a couple of stops but managed to reach the top. The views of Lviv from up there are spectacular, and I am taking lot’s of photos. 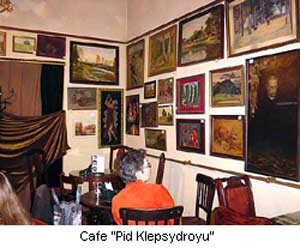 Visiting a small museum next to the Town Hall and there is a lovely small cafe with its walls full of nice paintings for sale! From there we visit one of the oldest Pharmacies, dated back to 1783 which is well preserved and now is also a museum too. Spent the rest of the day, walking around the Svobody avenue, visiting many interesting small places, eating lunch and then dinner and finally at around 10 PM I am back to the flat exhausted from the long walk, and very soon go to sleep. Very impressed with Lviv and very happy that I made the effort to visit this charming place. magnificient article, but I really love it about the way you connected with Ioannina, is where I am from, from Papigo, a beautiful village you probably know it. Hello and welcome to the board. Thanks for your good comments about my article. I am sorry but commercial links are not permitted on the board. Please read the rules.